We are caught up in the simple but precise argument that if there was nothing to begin with how could there be anything at all? And the core of our argument is that the existence of God is “an imperative of metaphysical reasoning,” or even of simple logic. Wilhelmsen states that “the metaphysics of being is simultaneously the Philosophy of God.” Such a statement finds correlation in the Bible, where God is revealed to Moses as I AM (Exodus 3: 14 ). And Jesus says – rather amazingly – that he is “the life” (John 14:6 ). In other words, God is that very beginning, or that very unbeginning, the absence of which there would simply be nothing. The “Supreme mystery,” then, is the mystery of a Being whose very essence is to exist. The philosopher says that God exists simply in virtue of Himself, so that God is the pure act of existing. “God affirms himself as the absolute act of being in its pure actuality” (Etienne Gilson). “God is the eternally subsisting being. God, then, is not only pure spirit, He is being itself subsisting immaterial at the summit of all things and transcending any limits imposed by either space or matter or a finite spiritual essence. Now, because God is the self-subsisting being, the infinite ocean of spiritual being, unlimited, unmaterialized, He is distinguished from every material or spiritual creature. The divine essence is existence itself, it alone of necessity exits. No creature is self-existent; none can say: I am being, truth, life, etc. Jesus alone among men said: “I am the truth and the life,” which was the equivalent to saying, “I am God” (Providence, 70-71). Another scholar, quoting Jacques Maritain, says that “the act of existing is the key to St. Thomas’s philosophy, and it [being] is something super-intelligible which is revealed in the judgment I make that something exists. ‘This is why, at the root of metaphysical knowledge, St. Thomas places the intellectual intuition of that mysterious reality disguised under the most commonplace and commonly used word in the language, the word to be…that victorious thrust by which it [being] triumphs over nothingness. '” Our affirmation or intuition of being, then, leads us to “the affirmation of Being Itself, God” (Wilhelmsen). On another occasion Jesus encountered a grieving woman, Martha, whose brother Lazarus had died, and Jesus said to her (before raising Lazarus back to life): “I am the resurrection and the life” (John 11:25). This profound pronouncement of Jesus demonstrates that he “possesses the absolute sovereignty over life and death” that is “the sole prerogative” of God (ICSB). CONCLUSION: God is life, or, as the Bible says, God has LIFE in himself (John 5:26). “God is the ultimate Possessor of life per se” (Pulpit Commentary). This is a great mystery, but it is a mystery confirmed by Scripture and human intelligence, and St. Paul warns that our minds are darkened if they don’t rise to a knowledge of God (Romans 1: 19-22; ICSB). So, we return to the ultimate philosophical question, Why is there something rather than nothing?, and we must conclude that nothing can produce nothing! And it is only because God IS (that is, because God is ETERNAL LIFE, the eternally subsisting Being) that we hold on to life day by day, hour by hour, moment by moment. Our present “to-be-ness” is completely dependent on Him who IS I AM. And in this light we can come to see in a more penetrating way that God has the power – as the eternal custodian of life – to raise up our mortal bodies on the last day (John 6:40). References: The Paradoxical Structure of Existence by Frederic D. Wilhemsen; Providence by Father Garrigou-Lagrange; Baker Encyclopedia of Christian Apologetics under the title, “Principle of Causality” beginning at page 120; The Spirit of Medieval Philosophy by Etienne Gilson; Existence and the Existent by Jacques Maritan; and Ignatius Catholic Study Bible. 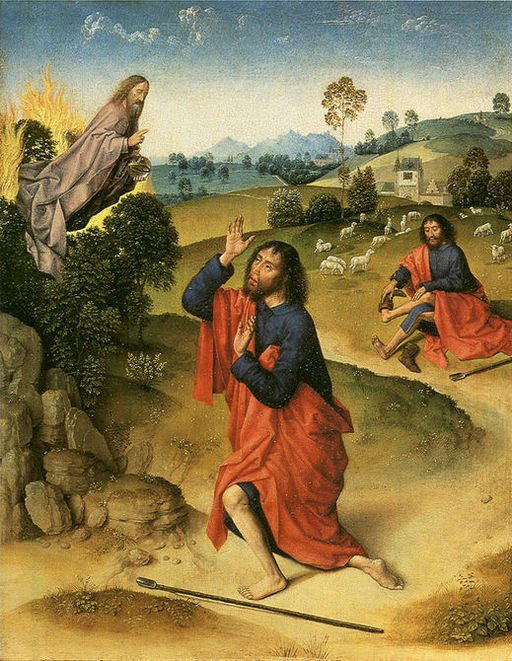 Image: Moses and the Burning Bush, circa 1450-1475, attributed to Dieric Bouts, Public Domain, U.S.A.